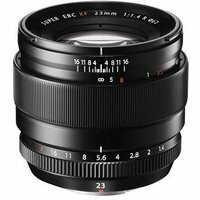 The Fujifilm 23mm f/1.4 XF R Fujinon Lens is a fast, wide-angle prime designed specifically for Fujifilm X-mount CSCs. It is suitable for a vast range of applications, including landscapes, travel, and night photography. Its bright f/1.4 aperture allows you to capture crisp stills and handheld movies, even in low light conditions, whilst its rounded 7-blade diaphragm provides smooth bokeh for portraits.